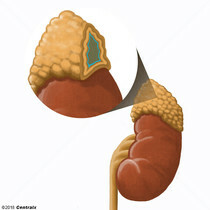 The outer layer of the adrenal gland. It is derived from MESODERM and comprised of three zones (outer ZONA GLOMERULOSA, middle ZONA FASCICULATA, and inner ZONA RETICULARIS) with each producing various steroids preferentially, such as ALDOSTERONE; HYDROCORTISONE; DEHYDROEPIANDROSTERONE; and ANDROSTENEDIONE. 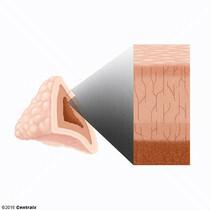 Adrenal cortex function is regulated by pituitary ADRENOCORTICOTROPIN. 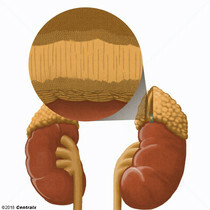 The inner portion of the adrenal gland. Derived from ECTODERM, adrenal medulla consists mainly of CHROMAFFIN CELLS that produces and stores a number of NEUROTRANSMITTERS, mainly adrenaline (EPINEPHRINE) and NOREPINEPHRINE. The activity of the adrenal medulla is regulated by the SYMPATHETIC NERVOUS SYSTEM.